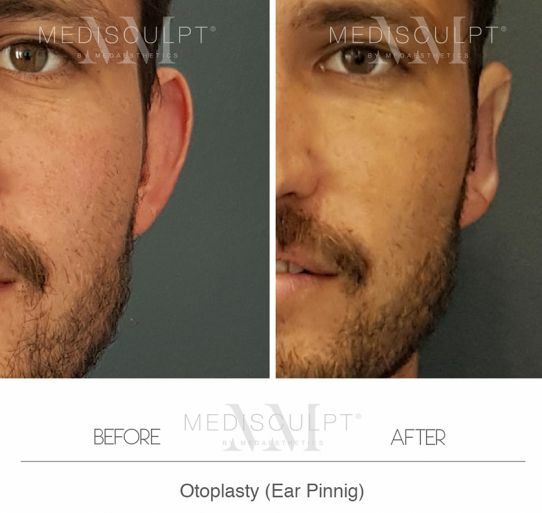 Otoplasty or ear pinning surgery is generally performed to pin back and reduce the size of large and/or protruding ears that may cause an unaesthetic appearance. Stretched or torn Ear Lobe Repair is one of the most routinely performed surgical procedure at Medaesthetics®. Dr Ehsan Jadoon offers minimally invasive dermatological surgical procedures on face and neck. Important: Any surgical or invasive procedure carries risks. Before proceeding, you should seek a second opinion from an appropriately qualified health practitioner. All images displayed on this website are property of Medaesthetics®. Formal Consent has been obtained from respective individuals (where required) who’s images have been used. Before/after photos are of actual Medaesthetics® patients and are for reference purpose only and are subject to Copy Right laws. Individual results may vary. How is the Otoplasty or ear lobe repair performed? Local anaesthetic is injected with a very fine needle. Once the area is numb, the excess tissue is excised using radio wave surgery device. There is virtually no pain associated with this procedure once the area is fully numb. The incision is then maticulously repaired using fine stitching on the front and the back of the ears. Stitches are removed in 5 to 7 days. Otoplasty takes between 2 to 3 hours. Earlobe repair surgery takes about 30–60 minutes. Infection is the biggest risk with ear surgery. We advise our patients to keep a close eye on the treated area during the healing phase, to keep it clean and notify us immediately if there are any signs of infection. Oral antibiotics are warranted if infection occurs. There are some other rare complication which are discussed with the patient at the time of consultation. This includes delayed healing, scar formation and under or over correction. Who should not undergo ear lobe repair? (If there is any doubt, please discuss this with our doctor). Cost of ear lobe surgery depends upon the extent of damage. Small tear repair costs around $400 per earlobe. Repairing larger tears and stretched earlobes is a more time consuming surgery and may cost up to $800- $1200 per side. Otoplasty surgery costs between $4000 – $6500.